When I heard that Steve Jobs had passed away, I was boarding a train from New York to Philadelphia to visit my son. A friend phoned and then text-messaged me the news before I could read it on Twitter. It felt, I said later, as if someone had torn the hair out of my head. I’m on my way to PHL to see my son, who uses a device Steve Jobs invented to help him talk. He will never know. He will never know. My son is on the autism spectrum and has a severe receptive and expressive language delay. He’s four years old, and can read and spell words, and sing entire songs, but is more like an 18-month or two-year-old in normal conversation. He cannot use a telephone and has a hard time sitting still for video telephony. He has a thoroughly well-loved iPod Touch, filled with videos and apps that have helped him learn to speak and augment his ability to communicate. My tweet about my son was retweeted almost 500 times, more than anything else I’ve ever written in 140 characters, and put me in touch with other parents of children with special needs — strangers — some seeking information, some wanting to share their stories. It may be a stretch to say Steve Jobs invented the iPod Touch or most of the technologies contained in it. But Steve Jobs certainly put it in my son’s hands, both by making it a sub-$200 device (and in our case, giving it away free with a laptop) and by helping to create an ecosystem of software applications for people with disabilities — perhaps especially communication disabilities. Apple’s post-PC devices disrupted a hell of a lot more than just point-and-shoot cameras. 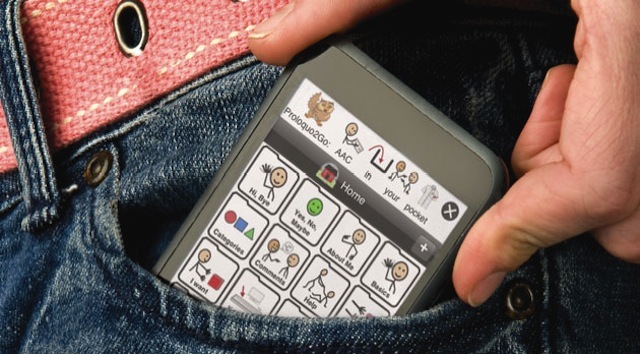 Assistive and augmentive communications devices with cutting-edge technology like touchscreens used to cost thousands of dollars. It was impossible to produce the devices at consumer-technology scale, and the cost of the device was borne by insurance (when it was borne at all). “Accessible” means “something everyone can use.” In pop culture and consumer technology, “accessible” sometimes means things that are easy for lots of people to understand or enjoy. In the disability community, “accessible” means something is open to people of all abilities, usually because it was designed with them in mind. And in both spheres, “accessible” can mean something almost anyone can both find and afford. Like anything else, Apple’s iThings can sometimes seem too complex, too presumptuous, too expensive. But really, even with their limitations, they’re amazingly accessible in every sense of the word. The iPod and iPad have been called “a near-miracle device” for children and adults with autism. In that formulation, “near” is as important as “miracle.” It’s not simply miraculous. Nothing that solves a real problem, rather than an invented or infomercial problem, is. [T]he potential of the iPad is not achieved by the iPad alone, nor by simply placing it in the hands of a child with autism. The potential of the device is realized by the way professionals like speech pathologists, educators, occupational therapists and early childhood development professionals apply their skills and knowledge to use the iPad to effectively support the development of children. The potential is realized by engaged parents working with those professionals to explore how the device best meets the individual needs of their child. You see, it is called Autism Spectrum Disorder (ASD) because the impact it has on a child’s development spans the breadth of development. No two children can be supported in exactly the same way. Sometimes my son uses his iPod to do amazing things. Sometimes he uses it to play games and watch videos over and over again. (He likes Super Why! and Michael Jackson.) Sometimes it’s hard to tell what’s helping him connect with other people and what’s closing him off from the rest of the world. I’ve written about technology long enough to know that this is hard to tell not just for him, but for any of us. Wired: What’s the biggest surprise this technology will deliver? Jobs: The problem is I’m older now, I’m 40 years old, and this stuff doesn’t change the world. It really doesn’t. Wired: That’s going to break people’s hearts. Jobs: I’m sorry, it’s true. Having children really changes your view on these things. We’re born, we live for a brief instant, and we die. It’s been happening for a long time. Technology is not changing it much – if at all. These technologies can make life easier, can let us touch people we might not otherwise. You may have a child with a birth defect and be able to get in touch with other parents and support groups, get medical information, the latest experimental drugs. These things can profoundly influence life. I’m not downplaying that. But it’s a disservice to constantly put things in this radical new light – that it’s going to change everything. Things don’t have to change the world to be important. To me, that says a tremendous amount about Jobs’ perspective and priorities. It shows the standard he set for himself for true change, and how and when he knew he wasn’t meeting it. Apple never had a perfect record when it came to user accessibility. No technology company does. But I bought my first iPhone when I broke my arm, because it let me use a computer with one hand. And on Tuesday, when I saw Apple’s demo video for Siri, its new voice-command AI assistant — which ends with a blind woman using Siri to send and receive text messages — knowing that blindness has been the disability least well-served by the touchscreen revolution — I wept. I’m weeping again now. These frail and fragile bodies don’t always work the way we want them to. Steve Jobs understood that. Steve Jobs succumbed to that. But he also left us things that make that easier, that let us touch people we might not otherwise. That will always touch me.